Love against all odds is a nice story to read. The story of Shakespeare’s Romeo and Juliet is one and Esquivel’s Tita and Pedro is the other. Tita is the youngest of the three daughters of Elena. Family tradition dictates that Tita, as the youngest daughter, is not allowed to marry and should care for her mother until the latter’s death. Because of this, Pedro was forced to marry Rosaura so as to be close with her as much as possible. The result is a tense atmosphere inside their home that is expressed by the author in magical narrative and exaggerations. 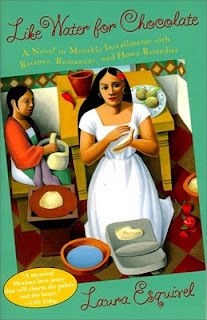 The book is presented like a cookbook that contains recipes, romances, and home remedies. The story is unfolded along with the preparation of the food in the recipe was cooked. The book has 12 chapters that correspond to the months of the year. Some of the recipes in this book are Christmas rolls, Northern style chorizo, Champandongo, and Chiles in walnut sauce. Food lovers and enthusiasts will definitely love this book. Like Water for Chocolate is the story about love and its complexities. Loneliness and longing due to love abounds this novel as well as the triumph of true love as the lovers fought all the odds that blocked their way. :-) eVERYBODY LOVES THAT KIND OF STORIES. Especially when love is victorious in the end. Thanks for the visit. Thanks for visiting me here in my blog.